When entering reception of the most prominent office building in Green Park, the first thing you noticed was the four story lift in the vast atria. 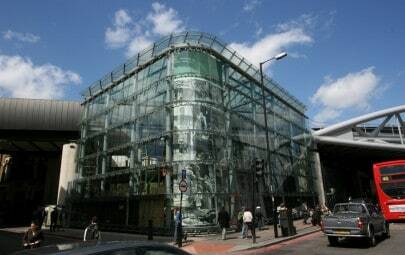 The modern steel and glass architecture lacked colour and warmth. Architect, Julie Heron of Barr Gazetas approached Architen Landrell with a vision that was inspired by nature. Situated adjacent to a lake and in natural setting, it was important to bring colours and patterns from the outside inside, creating an organic and striking space. With an abundance of glass, Julie wanted light and colour to reflect, shine and move throughout the atrium. 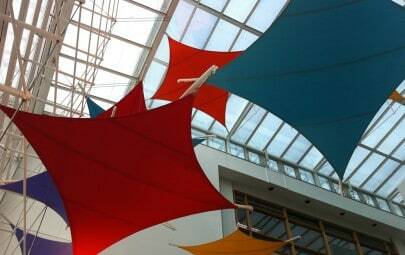 While Architen are tensile fabric specialists, we also are skilled at solving design challenges with other materials. On Barr Gazetas recommendation, we created a perspex louvre slat system patterned and printed with colourful ivy and leaves. 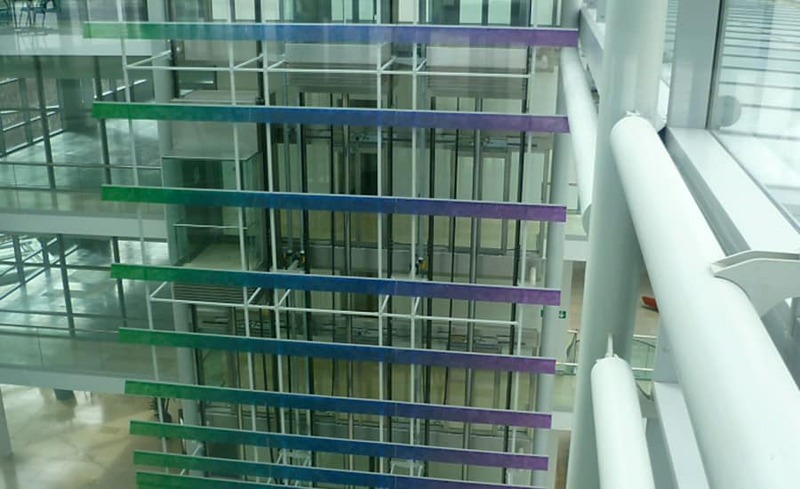 The design challenge was to transform the four story lift into a focal point using 21 rows of perspex each measuring 7.5m wide by 250 mm high. This colourful perspex design theme also can be seen on the new light box reception desk. Architen design, manufactured and installed a lightweight steel framework system that is suspended from the roof of the atrium and is fixed directly to the lift structure. 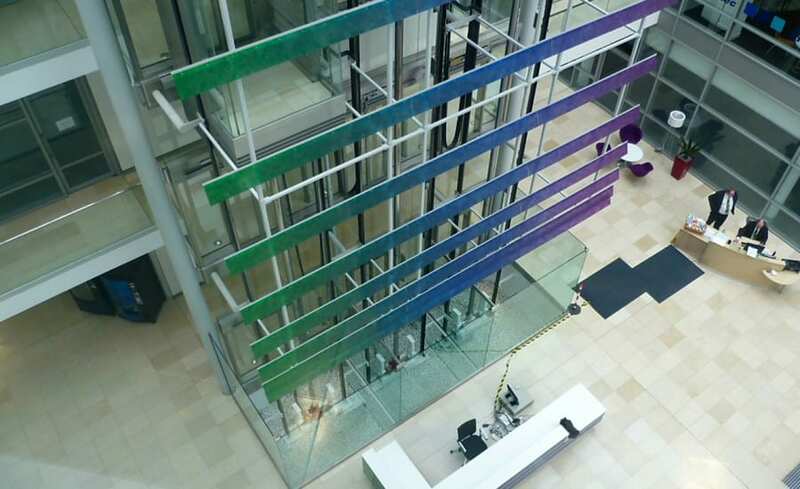 We had to carefully design around the lift, ensuring the steel frame disappeared behind the colourful perspex. It was critical that each panel was tilted upwards (at the exact specified degree) in order to maximise the visual impact from the front door of the building. Architen Site Operatives worked during the evenings to ensure the installation did not interfere with business hours. To reach the top panel (15 meters high), required specialist plant. Operatives used a Spider Mobile Elevating Working Platform (MEWP) which delicately treaded across the limestone floors, allowing us to carefully complete the installation. During the day, colours and patterns dance across the walls, floors and ceilings of the space, while at night, lights shine and reflect off the perspex. Everyone is more than pleased with the result. 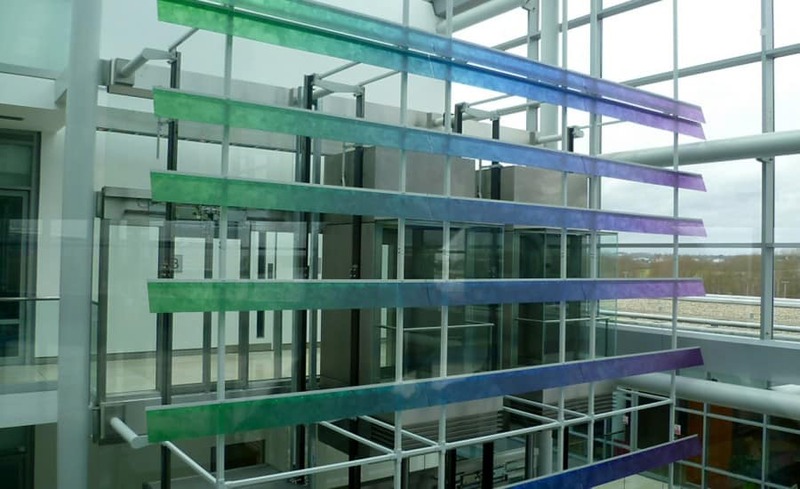 Chris Irwin, Project Manager, had this to say about the project: “having seen the space before and after, its amazing how the colourful installation grabs your attention when entering the building the result is striking and beautiful”. 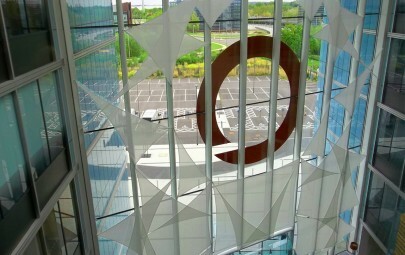 Architen was pleased to be working with Barr Gazetas on another striking project. We look forward to our next one.